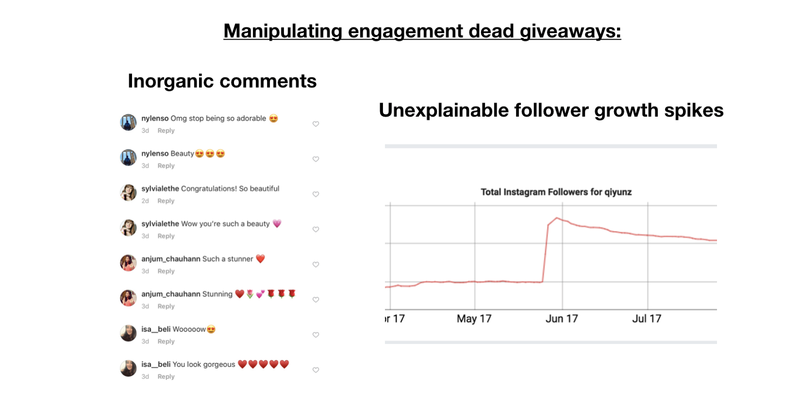 Engagement is the most important metric on Instagram because it tells you how strongly an audience cares about the content (and that’s how you make money). When building a business on Instagram, everything you do should be focused on 1) maximizing the number of people who look at your content and 2) care enough about it to take action whenever you ask them to do anything (tap, click, buy, comment, share, think, etc). You, I, and most other people look at hundreds of posts on Instagram, but we usually only “like”, comment, share, save, or buy the ones that we care about. The posts that we don’t care about, we tend to ignore. We also tend to engage the most with the posts from the people we care about the most. Being able to create content that generates real engagement is the first necessary step to driving traffic and creating monetary value on Instagram (traffic = people that are interested in buying your product = sales = monetary value). Finding and onboarding the most highly engaged influencers on Instagram is how we grew Depop in America and how I growth hacked my Instagram account to make a living from it. That’s why highly-engaged influencers on Instagram are getting larger paying contracts vs. content creators who only have a large follower number, but not high engagement. All things equal, out of two Instagram content creators with the same amount of followers, the one with the higher engagement will drive better results because a larger percentage of their audience takes action when viewing their content. That’s why you want to have the highest engagement possible on your account or pay to be tagged by influencers who do if you intend to make money on Instagram. To measure engagement properly, you want to know an account’s current engagement, not its historic one. That’s why you calculate the average number of likes on an account’s posts 4 through 10. These are the posts that generally give you the best indication of its current engagement during the past week or two. To calculate, you add the number of likes in posts 4 through 10 and divide that number by 7. Why measure posts 4–10 and not more or less? You want to measure current engagement and posts 4–10 are the posts that, in general, give you the best indication of an account’s engagement in the past week or two. Posts 1–3 tend to have been posted recently, which means that they are still getting likes on home feeds and you won’t get a realistic measurement of engagement by using those. Posts 11 and older tend to have been posted weeks previous to the time of measurement, which means that they represent the engagement the account generated in the past, but not necessarily currently. Why measure likes and not comments? Right about now you’re probably asking yourself “why should we measure likes and not comments? Aren’t likes easily bought?”. Yes, likes are easily bought, but so are comments. And one bought comment will make a much bigger difference in manipulating engagement rate vs. one bought like, since there’s a much smaller number of comments vs. likes on the platform. This makes likes generally much more complicated to manipulate consistently over time in comparison to comments. 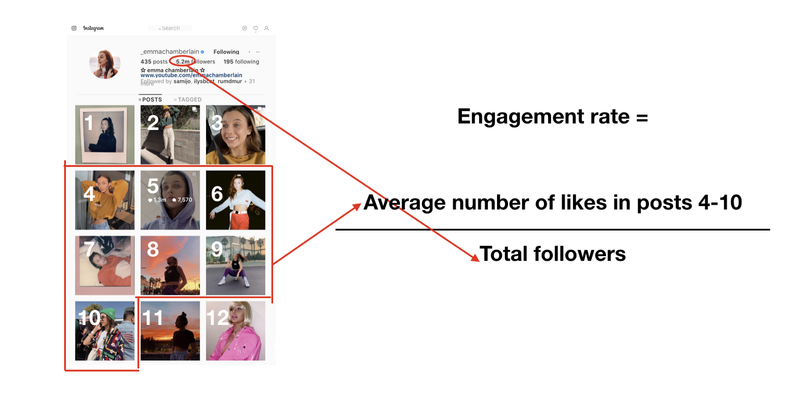 Also, average like engagement metrics on Instagram is readily available, which allows us to know what is high or low like engagement, in comparison to other accounts (more on this later). There is no such engagement data for comments, which makes it a less useful metric when comparing. If the account that you’re measuring posts more than once per day, you should calculate it by measuring posts 4–15 and dividing that number by 12. By taking into account a larger number of posts, you’ll be measuring closer one week’s worth of engagement (since they post more often). Once you have the average number of likes in post 4–10, you divide that number by the total number of followers of the account and you get the engagement rate. By doing this, you’re technically measuring the average number of followers who cared enough about that account’s content over the past couple of weeks to take action and like their posts. The higher the engagement, the larger the percentage of their audience cares enough about the content to take action and the higher the likelihood that they are willing to click, follow, or buy something tagged in their posts = higher value. I wouldn’t expect any significant value driven from Instagram accounts with 12% or less engagement. Knowing this, if you are paying an influencer to promote your brand/product/account, I recommend that you work with someone who has at least 12% engagement. They are much harder to find, but they are in the top 1% of most highly engaged accounts on Instagram and the most likely to give you the highest return per dollar spent. In the same line, if you are a content creator, you should aim to have at least 12% engagement (and over 15K followers) to be able to charge top dollar now and in the future. With the amount of content competition on Instagram, accounts in this tier are the most likely to be able to build long-term highly valuable businesses. 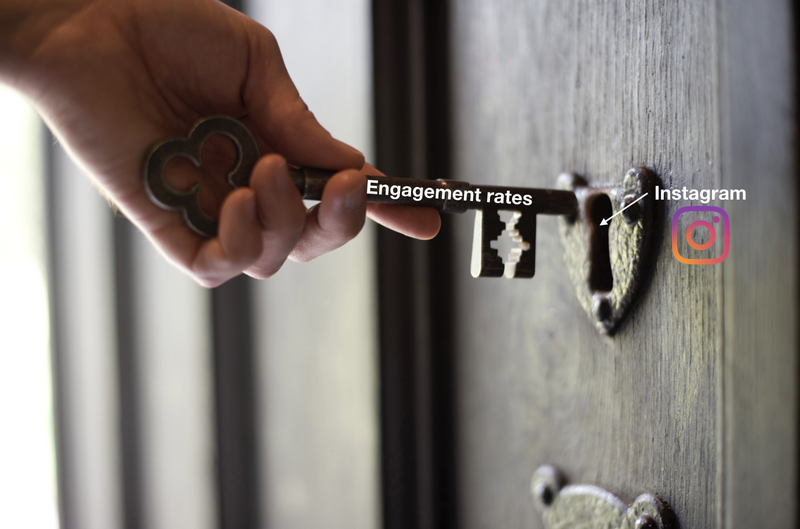 Last but not least, if you’re calculating engagement rates to make decisions regarding influencer marketing or potential partnerships, it’s important that you make sure that the numbers you’re measuring aren’t artificially manipulated. To do that, first, check their comments to see if they seem to have a high percentage of pod-related or bot-like accounts leaving inauthentic comments (pods are commonly used by influencers to artificially raise engagement rates). You can also use Social Blade to check for inexplicable and frequent spikes in follower growth (most people who buy followers will buy engagement) or just be plain sure by using third-party tools like Hypeauditor to get a professional audit (they charge, but they are the only reliable Instagram audit service I’ve found so far). That’s it! 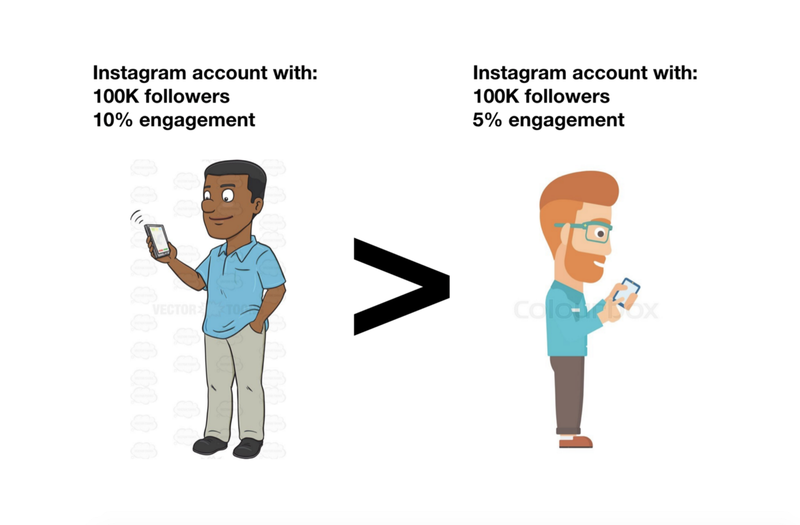 You now know how to properly measure engagement rates on Instagram. So, if you want to earn money from your account, work hard to create content that people love to engage with or pay people who do to promote you. It’s the only way to build a long-term sustainable business without spending tons of money on ads!